Cycle Toronto is moving ahead with their campaign for protected bike lanes on Richmond and Adelaide Streets. 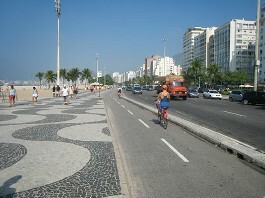 This would open up a safe cycling route into and out of the city centre from the west. Protected bike lanes can help to reduce the stress and make cycling safer for people biking downtown, especially for novice cyclists. 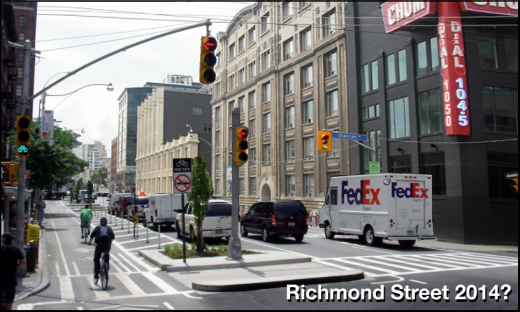 Richmond and Adelaide Streets are prime candidates. Richmond Street and Adelaide Street are high volume roads with average speeds above 40km/h. The Environmental Assessment is underway. We anticipate its conclusion by December 2013. City staff will also explore ways to have the protected bike lanes connect to existing bikeways west of Bathurst Street and east of Sherbourne Street. Cycle Toronto have even announced a Love-In at the Harbord Bakery (this being the business which, following an article in The Star, has come to be seen as the centre of resistance to the proposal). The blogs are buzzing with discussions about the proposal. I’m not going to go into any detail here, since you can read the comprehensive run-down on ibiketo.ca and dandyhorse. As I see it, the more funding the city puts into projects like this, the better. Once drivers and cyclists begin to see how they can share our roads, we will find increasing support for safe roads. 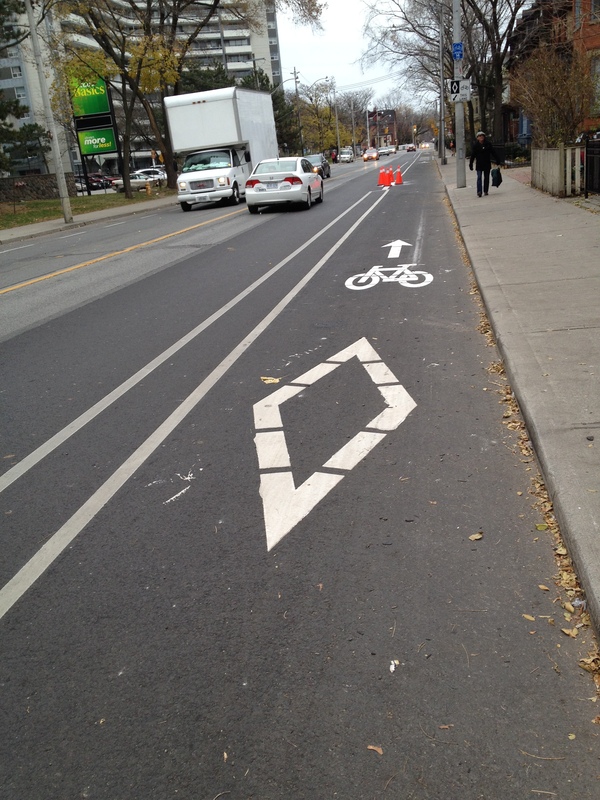 It may be true that, for the seasoned rider, unidirectional lanes on the north and south sides are better. 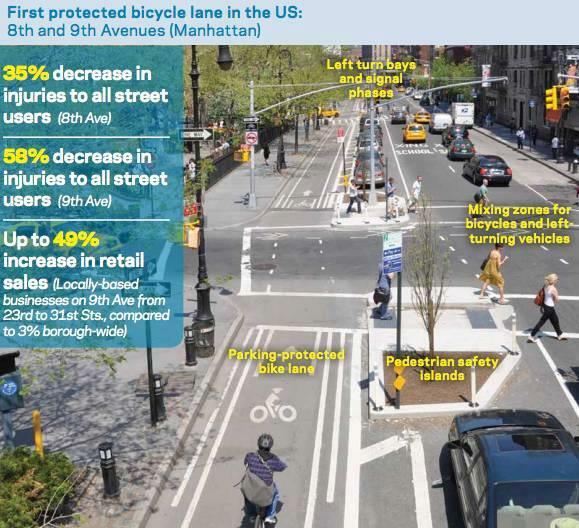 But bike lanes protected by a physical barrier will get more people cycling, which means fewer cars on the roads. And it’s a small step toward realizing more comprehensive and progressive visions of what cycling in the city can be, such as, for example, the Indianapolis Cultural Trail. 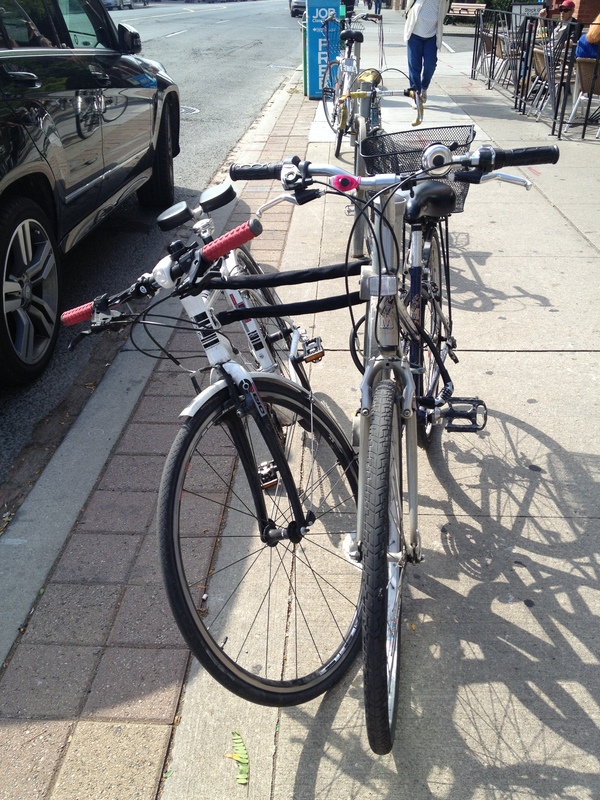 Do you ever have the feeling that your bike is handling more like a small sailboat? When you turn corners does it feel like the road becomes elastic and gelatinous? Do those little bumps and potholes jar your whole spine? It’s time to start dealing with inflation. If you’re reading this, you probably know this already, but inflation is something that even the most experienced cyclists need to be reminded of from time to time. There are few things that are as consistently neglected, and few things that can improve performance and general riding pleasure as much as correct tire pressure. Next to your helmet, the one accessory that’s really worth spending money on is a pump. If you have a good one, it’s easier to use, and you’ll find yourself taking advantage of it more often. 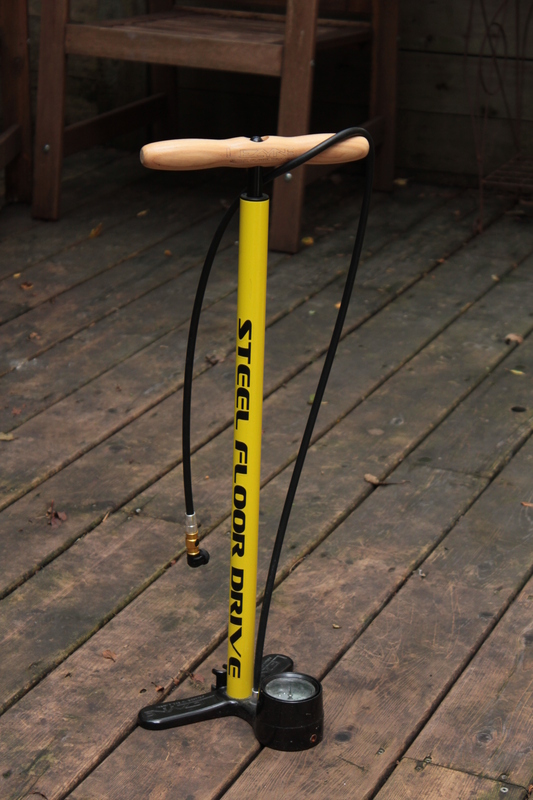 Mine is the Steel Floor Drive model made by the California company Lezyne. It sells for about $60. I got mine from the helpful people at Liberty Street Cyclery, who use the same model in their workshop. It has a quick and easy coupling, and the gauge is easy to read. 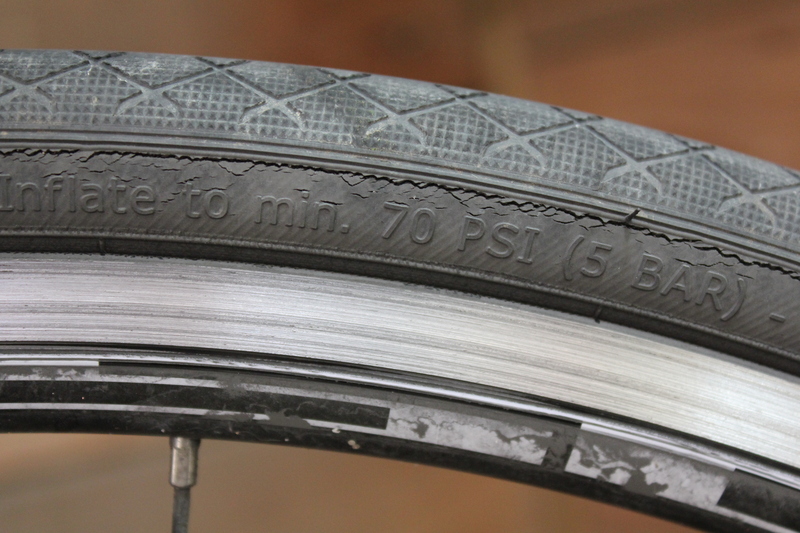 If you’re not sure about the correct pressure, you’ll find its embossed on the side of the tire. And see those cracks? That’s another reason to make sure that your tires are always correctly inflated. 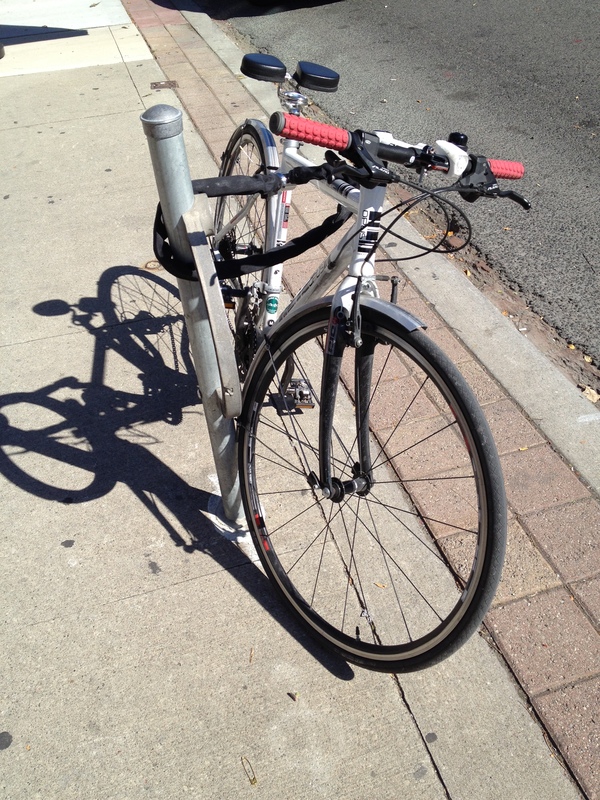 In Toronto, York Region and Waterloo, a collision is defined as “the contact resulting from the motion of a motor vehicle or streetcar or its load that produces property damage, injury, or death.” This doesn’t leave room for the dooring of cyclists, and as a result, there are no police statistics covering incidents of dooring in Toronto. Nor are there any real incentives for motorists to be more cautious. The traffic offence that leads to dooring — improperly opening a vehicle’s door, or opening it longer than necessary — carries a maximum fine of $85. In 2011, just 118 people were convicted of the offences Ontario-wide. According to an article on the topic in the Star, neither the police nor the Ministry of Transportation seem particularly interested in changing the fines, or even in tracking incidents of dooring. This leaves it to cyclists to track dooring incidents. Justin Bull has created a website to this end, Doored!, which just went live. 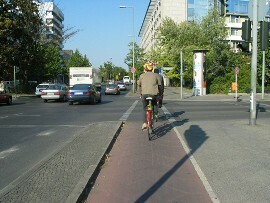 It allows cyclists to self-report a dooring incident. And it provides an archive of these incidents. Already, there are 12 incidents listed. What the usefulness or outcome of this initiative will be, remains to be seen. But it’s certainly a step in the right direction. Meanwhile, remember, if you are doored — even if you are not injured — get the license plate number, the driver’s details, phone the police to register an accident, and get visual documentation if you can. Then file an incident report on Doored!